The recent Gmail Theatre video was impressive. You can watch it here too. P.S If you get any trouble in config the POP Server. Do read the error message. It helps you! Yes as like several hundred young engineerings who skipped late evening work in their office to listen to "The Father". I was there at the initiation of the Google Speaker Series in Bangalore. 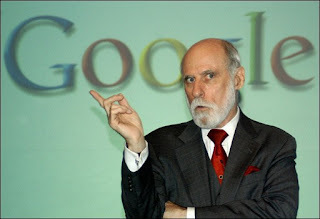 The talk was by Dr. Vinton G. Cerf, Vise President & Chief Internet Evangelist for Google. I still would be arguing with Santosh, that networks and related technologies have saturated. But let me think again. Cerf, had a good notion of humor. The talk was informative though it was not very technical. I see this as an awareness champaign to all the young brains who are looking for more challenges. The talk initially had a briefing on current trends on internet and how the world is divided by it. Next he spoke about the challenges that are faced by them. InterPlaNet - InterPlanetry Network Project. This talks about the inter space communication standards. The questionnaire was also interesting where he spoke about digital divide in India to the western world. Also as anybody would have guessed how did he end up in Google and what would take us to go there!